Power system state estimation is defined as process of obtaining reliable data for despatcher control. Estimation data with better conformity to the relations between network nodes. 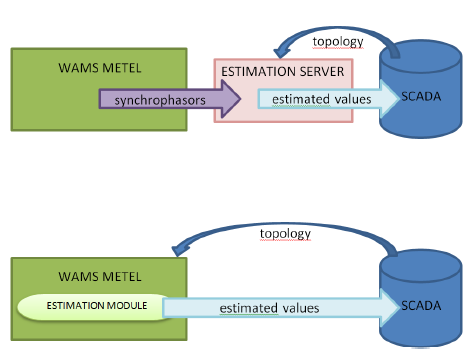 Estimation based on redundant measurements obtained by WAMS or SCADA. Wide-area simultaneous measurement in selected network places. Continuous data transfer via WAN to central station. Estimation software can be part of WAMS or SCADA systems. Flexible addition to the existing measurements. Significant addition of synchrophasors to the estimation measurement data set. More exact and reliable estimation results. Elimination of calculation errors caused by non-synchronous measurements. Economic solution in case of extension of estimation to adjacent parts of medium voltage network. Perspective to use dynamic estimation of voltage phasors for monitoring of transient processes in real time. Database pump to estimation system database, both push and poll methods supported. Data and protocol emulation of the third-party RTUs. Communication from central station to estimation system via standard communication protocols. Wide range of communication options on physical layer (Ethernet, RS-232, GSM/GPRS) and standard protocols (e.g. IEC-68570-5-101/103/104, IEEE-C37.118) implemented.